Sorry we haven’t updated our log before now, but there really hasn’t been much to write about. Other than a few day cruises, we haven’t done much boating. I wish we could report that we have been off on some exciting adventure, but unfortunately Susie has some major back problems and most of our time as been spent going to doctors. Hopefully that will change soon! 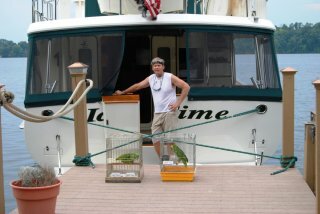 Although we haven’t been cruising, we have had plenty of boat chores aboard IT. Our guru mechanic, Scottie, came aboard and installed a second engine room blower. The captain is very pleased with this addition as our engine room temperatures are now about 20 degrees less. The injector pump on our generator developed a fuel leak so we had that rebuilt. Waxing, varnishing, and cleaning have also kept us busy. We have had near record rainfall her in Chattanooga over the summer and the humidity levels are thru the roof. We have been fighting mildew issues aboard IT and have barely been able to keep up with it. On a good note, we did find a fantastic forever home for Addie, the rescue Sheltie that we were fostering. We really enjoyed our time with her and were a little sad to see her go (all but Sebastian that is). We will spend the next 10 days exploring the Tennessee River. 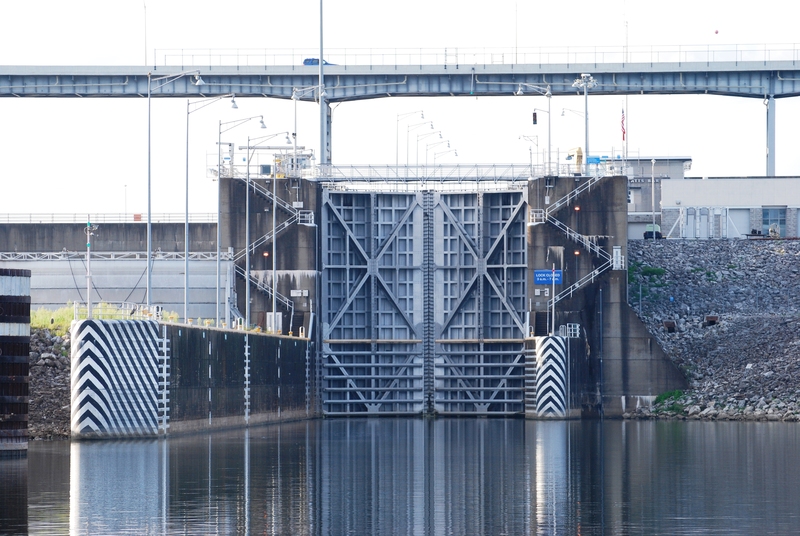 With the creation of the Tennessee Valley Authority as part of President Roosevelt’s New Deal, TVA has built 9 dams along the Tennessee River, thus making the entire 652 miles of the river navigable. We have cruised most of the Tennessee River but have not explored the area from Chattanooga North to Knoxville. Our goal is to reach the beginning of the Tennessee River where the Holston and French Broad Rivers intersect. It feels good to be back on the boat. 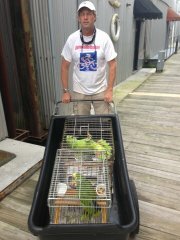 The morning is spent loading food and gear aboard IT along with the rest of the crew, Nate, Homer, and Sebastian. The birds must be excited too as they didn’t stop talking for almost the entire day. Sebastian quickly assumed his position in the pilot house. Just after a few minutes on the water, we can see some ominous clouds in the distance. One of our favorite anchorages, Eldridge Cove, is just a few miles ahead. We race the thunderstorm and make our anchorage just in the nick of time. We shut down all off our electronics and wait for the storm to roll over us. With the coast clear, we haul anchor and continue upstream to Watts Bar Lock. We have only a short wait and soon see the massive steel doors open. Having done over 120 locks now, we are getting the routine down pretty good. Exiting the lock, we are now on Watts Bar Lake. With darkness approaching, we opt for a close by anchorage in a small cove next to the Meigs County Park. The slew is narrow but opens up to give us more anchor swing near the back. 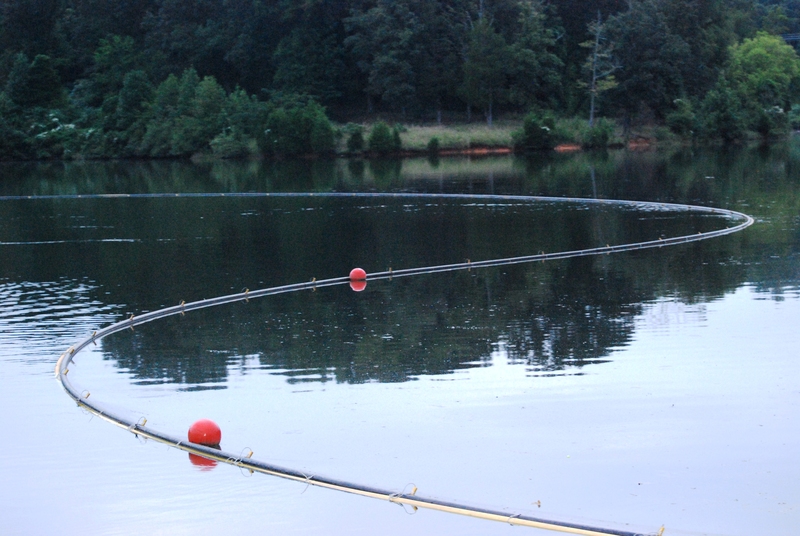 Our hook goes down just as the sun sets. It is a good first day. We awoke this morning to an unwanted surprise. When we came into the cove last night, we noticed some sort of skimmer boom in the back part of the cove. We were not sure why this was here but usually they are for oil spills. When anchoring, we took this boom into account and made sure our swing room would not encroach on the boom. We were at least 150 feet away. What we didn’t count on was the boom moving. It has now pushed up hard against our boat. Normally booms are anchored to the shore. It appears that this one has broken loose. To make matters worse, the other end of the boom is starting to block our only way out of the cove. We quickly started the engines and begin pulling anchor. We sure don’t want to be trapped in here. Luckily the boom gently eased out of our way as we nudge IT forward and we are allowed to escape the cove before becoming trapped. We won’t do that again! We are the lone boat out on the river this morning. 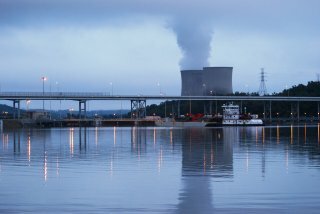 This section of the Tennessee River is known as Watts Bar Lake. 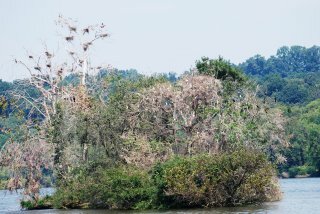 It is one of the best cruising areas of the river with a multitude of deep water protected anchorages to choose from. The shore line is sparsely populated. Today we are bypassing these anchorages as we have decided get to our fartherest point as quickly as possible and then take our time exploring on the way home. We check out and mark many of these anchorages as we go by saving them for further investigation. The river is wide and deep with many twists and turns. It is an easy cruise to our next lock 70 miles upstream. (Although we did almost run aground while someone was playing around with the I pad. He won’t do that again.) Fort Louden Lock and Dam is our last lock on the Tennessee River. 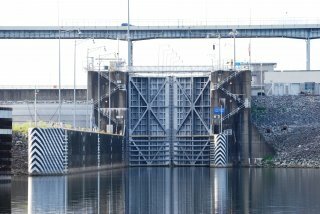 This lock was built in 1943 and is the second highest of the 9 dams on the river. It is massive at 122 feet high and 4190 feet long. We have an easy ride up the72 feet and are deposited into Fort Louden Lake. We continue 16 miles upstream to our anchorage at Concord Park. We anchor partway up the bay in 15 ft. of water and enjoy a quiet evening. It is pea soup fog this morning. We had planned on getting an early start but with zero visibility we aren’t going anywhere soon. The fog gradually lifts and we continue waddling upstream. 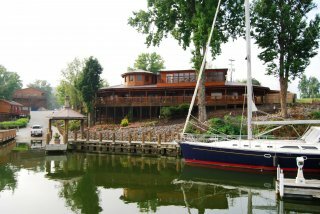 Expensive homes line both river banks. There certainly appears to be a lot of money in this area. Several of these big homes have a smaller carriage home down along the waterfront. These carriage homes are nicer than most people’s regular home. As we approach downtown Knoxville, the river narrows with high rocky cliffs. The University of Tennessee’s Agriculture division appears on our starboard. Expensive homes again line the port side shore. 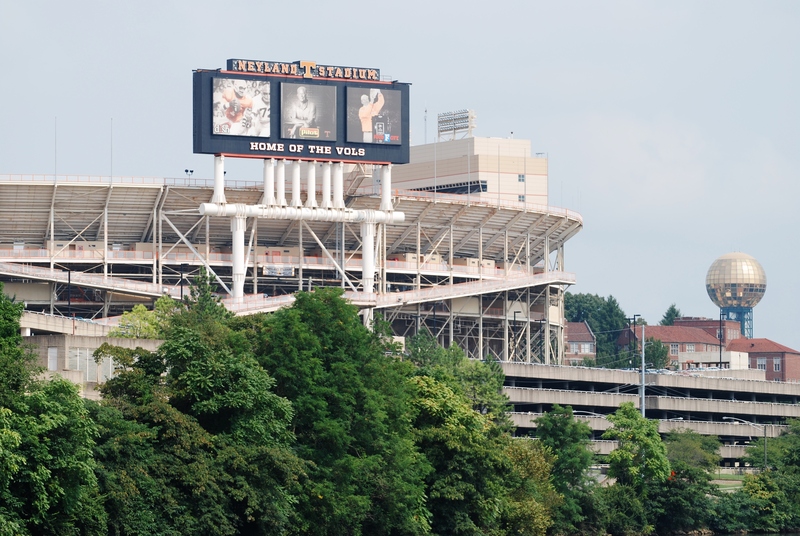 Downtown Knoxville with the UT Vols Stadium soon comes into view. 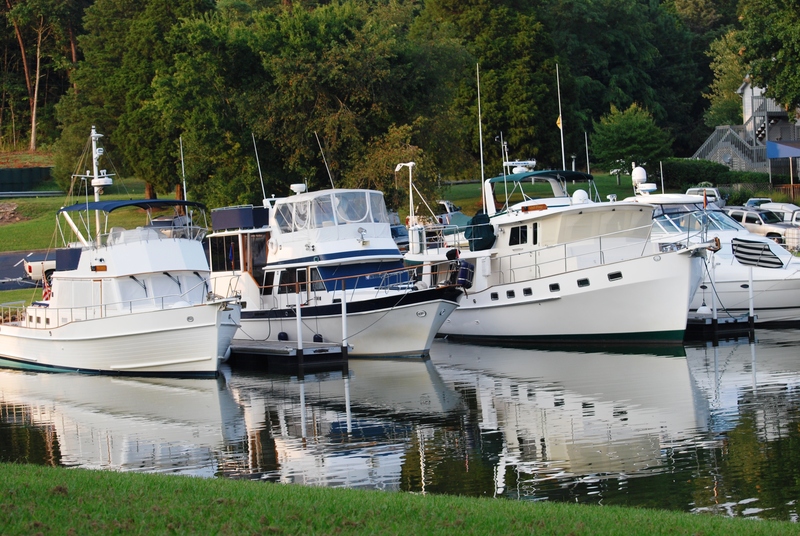 A month from now boats will be rafted 20-30 boats deep as part of the “Vol Navy” during the football games. The Knoxville waterfront is mostly industrial and not very attractive. We continue upstream for another 3 miles. Here we reach mile 652 which marks the beginning of the Tennessee River. 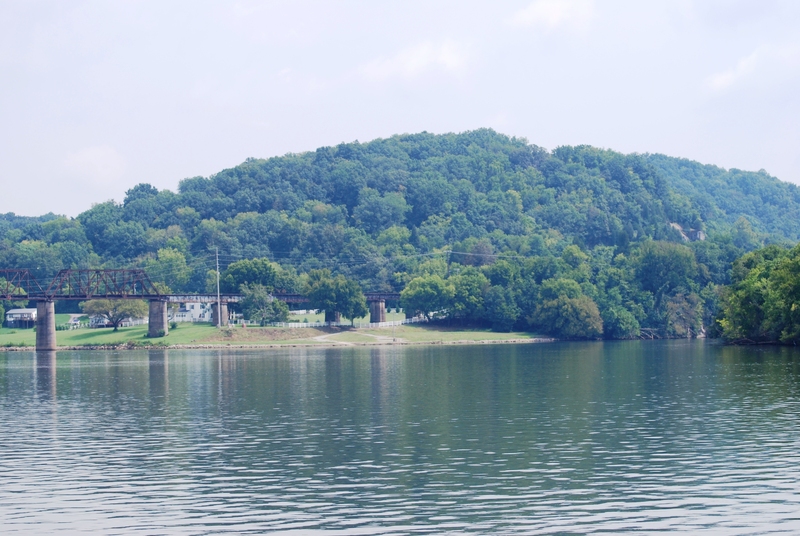 Both the French Broad and Holston Rivers intersect with the Tennessee River at this point. We have now cruised the entire length of the Tennessee River aboard Idyll Time. After touching our bow into the French Broad and Holston Rivers, we retrace our path and head back downstream. Thunderstorms start popping up around 2:00 PM. We duck into an anchorage called Poland Creek just before the storms arrive. Luckily we were able to get anchored and shut down all the boat electronics just before the storms walloped us. These afternoon storms have some wicked lightning. The storms soon pass and we enjoyed another peaceful nigh at anchor. The Bass fishermen are out in force this morning. 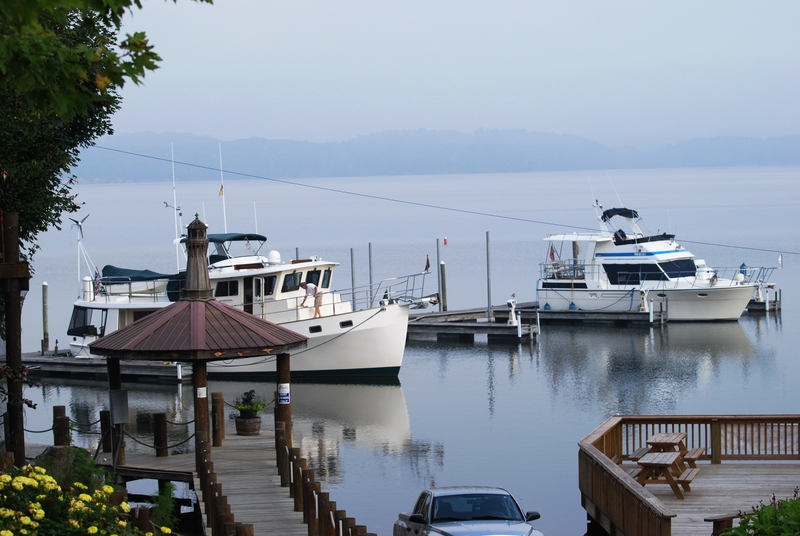 Our anchorage is just off a county park boat ramp and the bass boats roar by in multitude just after sunrise. We haul anchor and continue 20 miles downstream to Fort Louden Dam. 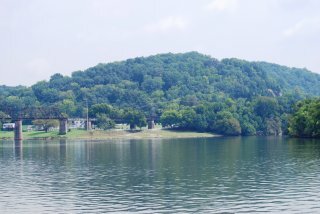 Here we detour off of the Tennessee River and take a hard turn to port which puts us into the Little Tennessee River. 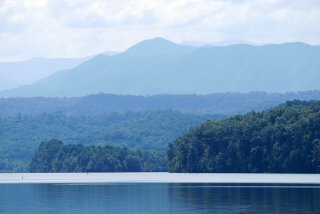 Also known as Tellico Lake the Little “T” is the cleanest, coldest, and clearest body of water on the Tennessee River. This river is navigable for 30 miles. Its beginning is in the Great Smokey Mountains. Much of this lake was at one time farmland. This area was flooded when the Tellico Dam was built. 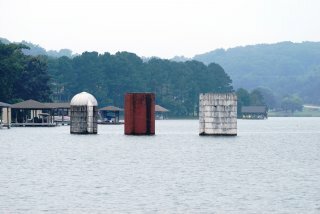 In fact we see several silos half under water along with a concrete roadway rising out of the lake. As we work our way upriver, we pull in several coves to check out some of the beautiful anchorages. There are many secluded spots to choose from. The Little Tennessee is by far a much nicer body of water than the Tennessee River. The water clarity is the best we have found since leaving the Great Lakes. Unfortunately this area has been discovered. 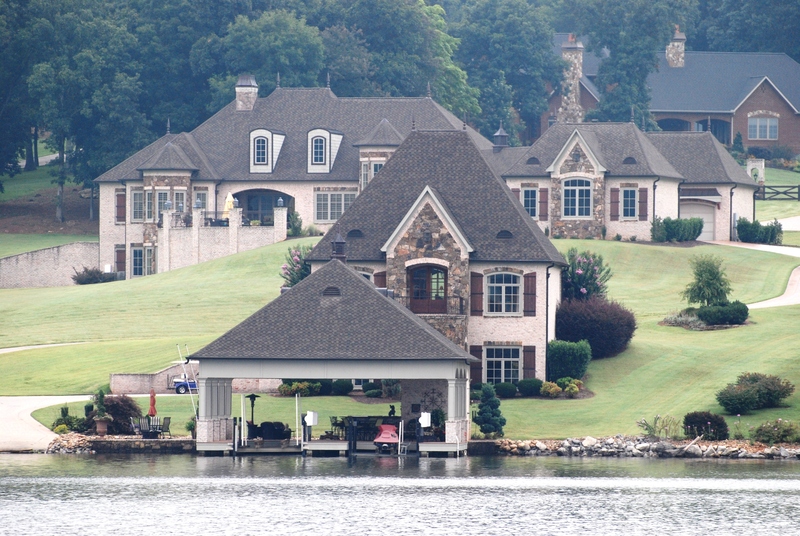 A large retirement community called Tellico Village has been developed over the last 20 years. The south bank of the Little T is crowded with homes and condos. Fortunatly the north shoreline is owned by TVA and will remain undeveloped. Good friends of ours from Chattanooga, Mary and Jerry, have just purchased a house here. At mile 10 we pull into their cove and find them on the dock signaling our arrival. 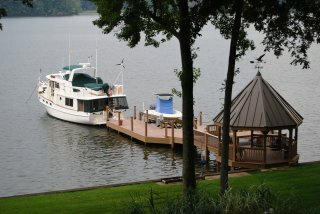 Their dock, being only 15 feet long, is too small for IT and the cove is really not wide enough for us to anchor. After studying the situation, we decide to try a “Med Mooring”. 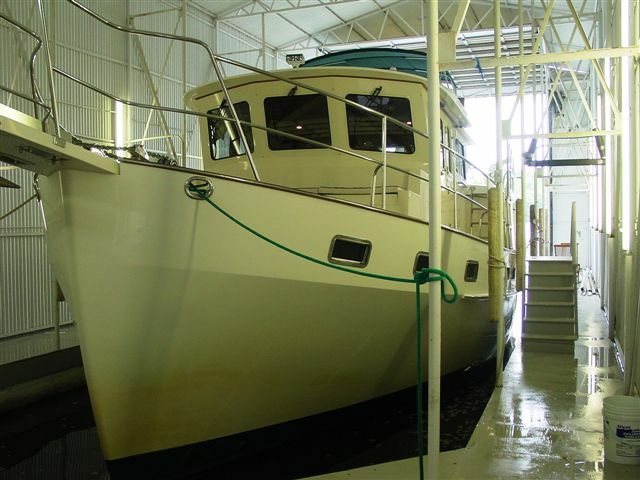 We drop the anchor 60 feet in front of the dock and back down with our stern about 5 feet alongside the dock. 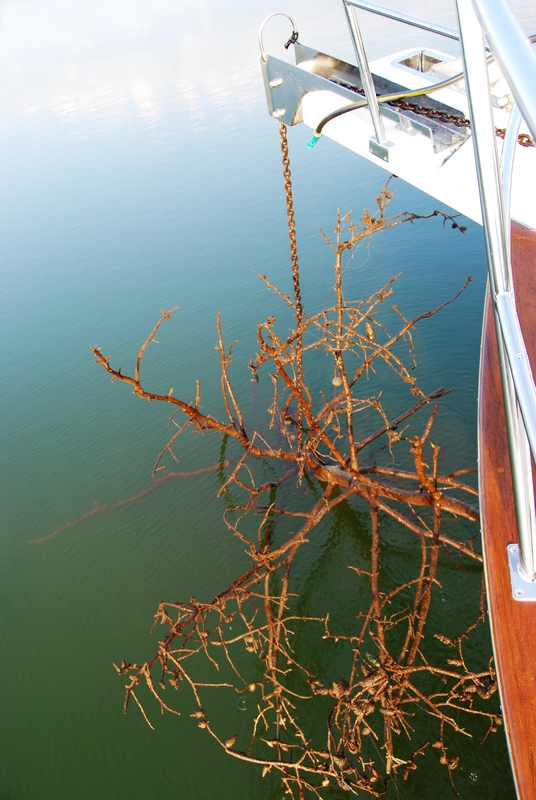 We secure our stern and spring lines to their dock with the anchor securing our bow. This was a first for us and it worked perfectly the first time. Mary and Jerry have a wonderful home here on the Little “T”. We have a great evening with them and appreciate their hospitality. We spend an enjoyable morning with Mary and Jerry. 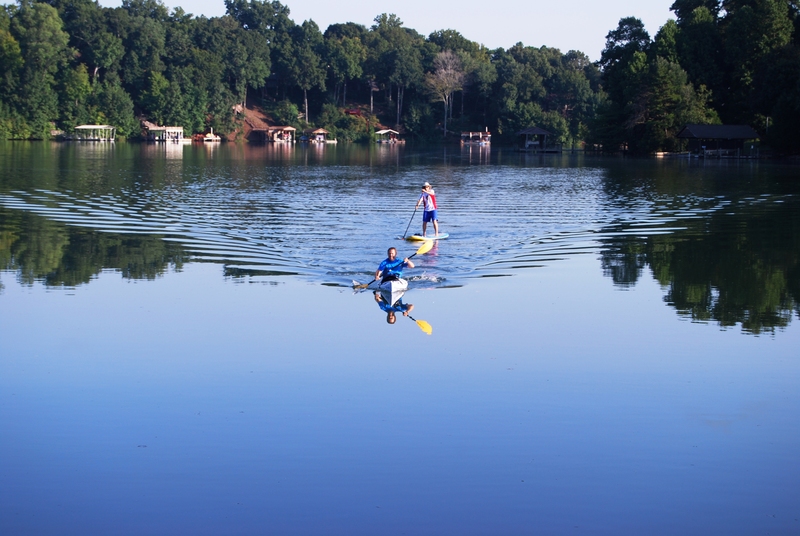 The kayaks and paddle boards come out for some exploration of Tellico Village. We look forward to many more visits to our good friends’ new home. 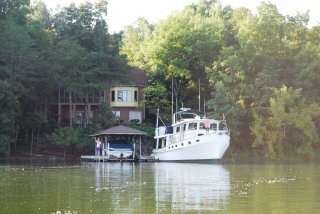 Back on the Little Tennessee, we have a relaxing cruise up river. The clear deep water makes the trip an easy one. It is a short day and we are soon to our anchorage at historic Fort Louden. After setting the hook, we deploy the dinghy for exploration. Touring the Fort, we learn much about its history. It was constructed by the English in 1756 and played a significant role in helping Great Britain secure the Appalachian region from France during the French Indian War. For awhile this fort helped ally the powerful Cherokee Indians with the British to block further French penetration of the area. Back aboard IT, we enjoy our evening at this tranquil anchorage. The views of the Great Smoky Mountains on the horizon are magnificent. As the sun comes up this morning we are again rewarded with some stunning views of the Smokey Mountains to the east. We have this spot all to ourselves and enjoy the beauty that it offers. It is another beautiful day for cruising with little wind and humidity and temperatures in the low 80’s. On these inland lakes one does not have to worry about wind and sea conditions. It certainly makes for much easier cruising than the Great Lakes or Ocean. Today we continue up the Little Tennessee for another 10 miles to mile 32, the end of the navigable river channel on the Little “T”. As we wind our way upstream, the channel markers become much smaller as the river narrows. The mountains loom closer as we round each bend of the river channel. This area remains undeveloped. We are again the lone boat on the river. 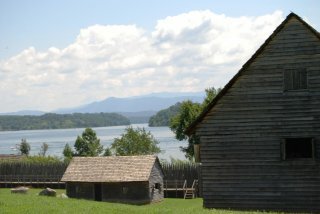 Being rich in Cherokee Indian history, several historical sites are evident along the river bank. We pass the former Indian towns of Chota and Tanasi. 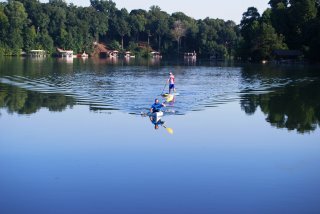 Originally Tanasi was the name the Indians gave to the Tennessee River. This was later modified by the white settlers to be known as the Tennessee. Reaching the end of the navigable channel, we turn around and retrace our steps. 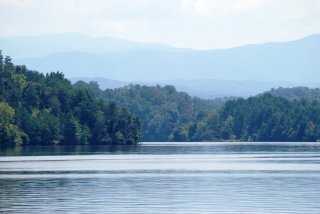 In a smaller boat, one could continue another two miles up river to the Chilhowee Dam. We will save that for a future dinghy trip. At mile 19 on the Little “T” we take another exploration detour and turn to port onto the Tellico River. Here as on the Little Tennessee, the farmland is being replaced with housing developments. Farther upstream, the river remains undeveloped and we have a beautiful cruise with the Smoky Mountains again looming in the background. At mile 9 the river shallows and is no longer navigable for boats our size. We again retrace our path. At mile 3 of the Tellico, we drop anchor just off the Sequoyah Birthplace Memorial and Museum. This afternoon we dinghy in to visit the museum. Here we learn that Sequoyah was a Cherokee Indian who developed the Cherokee alphabet. He was responsible for making the Cherokee Nation literate. His syllables are still used today by more than 10,000 people who speak the native language. It is another quite evening at anchor with no one else on the water. We have another surprise this morning as we are pulling up the anchor. Caught on our chain is a whole tree. 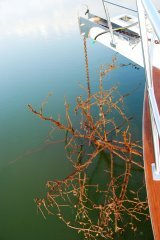 Not sure how to get this tree untangled from our anchor, we raise and lower the chain several times. Fortunately the tree worked its way loose and dropped back to the riverbed bottom. Continuing our cruise back down the the Little “T”, we notice several boat manufacturing plants along the shore. Sea Ray, Yamaha, and Christenson Yacht all have facilities here. Arriving back at Fort Louden Lock and the intersection of the Tennessee River, Fort Louden Marina, our home for the next two nights, comes into view. After taking on some fuel and a pump out, we secure IT in one of the transient slips. This evening we see a beautiful Grand Banks trawler coming into the marina. It turns out to be the boat Riverben. 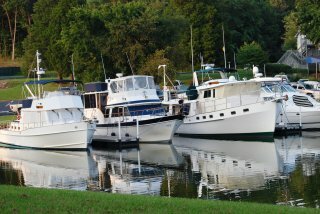 They have a slip at the Chattanooga Yacht Club just a few doors down from us. What a small world. Next door to the marina is Calhouns Restaurant, famous in these parts for their BBQ. They lived up to their reputation, and we enjoy a great dinner here. The ribs were excellent. Tomorrow we will pick up an Enterprise car and drive home to Chattanooga for the day, taking care of some business. Today we will begin our return trip downstream. Just after pulling out of the marina, we hail the lockmaster on channel 16. We are shocked to learn that the lock does not start work until 10:00 AM. There is nothing we can do about it but just sit and wait. The lock doors finally open and we enter the chamber. When locking up we were required to do a port side tie. Going down, we will be doing a starboard side tie. This side works much better for us as we have a walkway on the starboard side but not on the port. 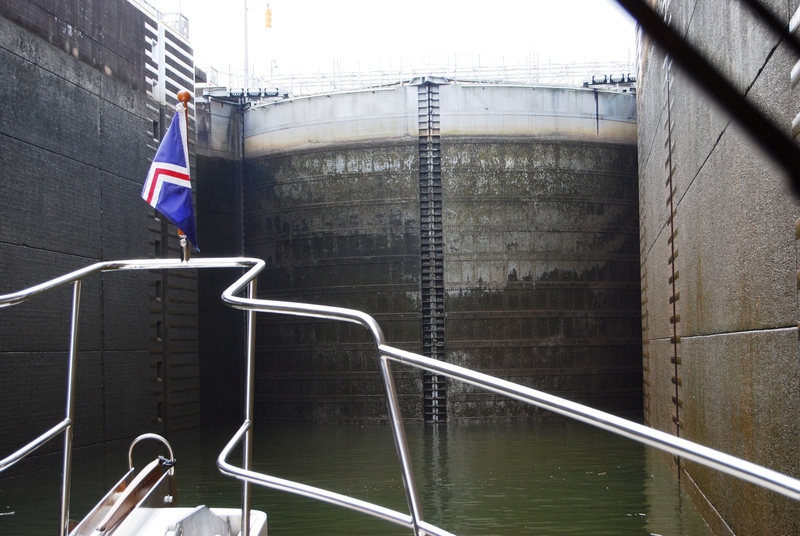 As with all locks, the ride down is much smoother than when going up. We have an easy but slow lock down and are soon back on Watts Bar Lake. We were accompanied in the lock by a 40 ft. cabin cruiser. Just outside the lock, we see him speeding up to pass us so we slow to idle speed to set up for a slow pass. Typically the passing boat will call the other boat and ask for a slow pass. This way both boats can go at slow speed and the boat being passed will not be rocked to badly. This guy obviously had no intentions of doing a slow pass. He went by us at full throttle throwing a 4’ wake. Afterwards, Jeff called him on the VHF to let him know that we had slowed for him to do a slow pass. He had no clue. He even asked where we were. We let him know that he just passed us and rocked us badly. At mile 584 we pass a small island that appears to be a rookery for white Egrets. One thing we noticed while on the Little Tennessee was the lack of bird life. 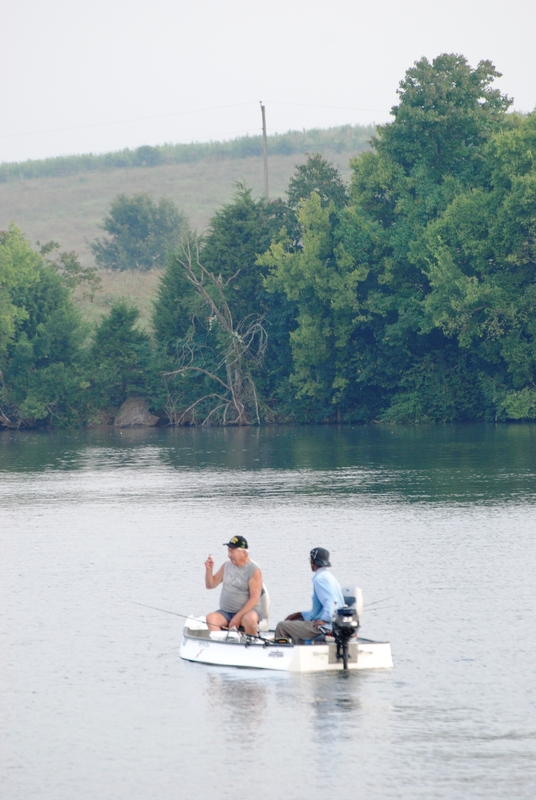 The Little “T” may have cleaner water than the Tennessee River, but they are short on wildlife. Today there are lots of boats heading north. 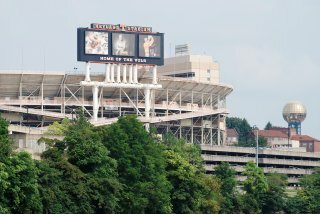 There is a UT football game in two days, so I suspect they are all part of “The Vol Navy” and are on their way to Knoxville. Arriving at the marina, we see the boat that waked us earlier, also pulling in. They end up docking a few slips down from us. While hooking up to shore power, we discover the power pedestal is not giving us full 220 volts. The marina manager comes over to help. We try using an adaptor and hook up to two 30 amps instead of the single 50 amp. This works but we can only run one A/C unit at a time without tripping the breaker. True to form, things are never boring around us. Just after having a great dinner at the marina restaurant, Jeff went back to the docks to get Sebastian for a walk. I was talking with another couple who were asking us about doing the loop, when Jeff and Sebastian arrived back at the restaurant. Soon afterwards, a big husky appears behind us. Earlier, we had seen this dog in the cockpit of a sailboat several slips down from us. It did not appear to be friendly and growled at Sebastian each time we passed by, but it never came off the boat. 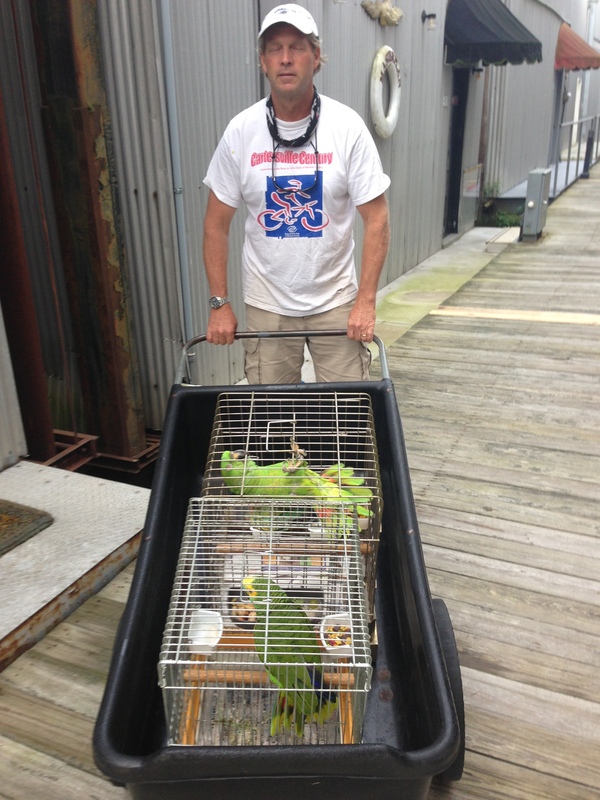 This time it followed Jeff from the boat docks and up the ramp to the restaurant. Before we knew what was happening, the dog attacks Sebastian. Jeff instantly snatches the dog by its scruff off the ground and marches it back down the docks. With the dog still trying to bite, Jeff throws the dog off the dock and into the water. He yells to the owner “Here is your dog”. The owner seeing his dog swimming for shore comes off his sailboat and retrieves his dog from the river bank. The owner then comes down the dock yelling “who threw my dog into the water” and threatened to throw them into the water. By this point there is a large crowd watching from the restaurant deck. Jeff calmly explained what had happened and the owner calmed down. He apologized several times and came up to check on Sebastian to make sure he was O.K. 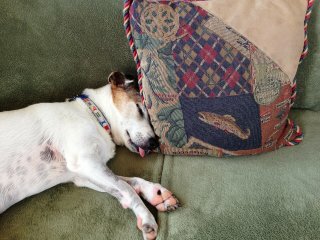 He then explained that he had only had the dog a few days and that it was not pet friendly. He should have kept the dog on a leash. Luckily Sebastian was not injured, just shaken up. This only reinforces Sebastian’s belief that all big dogs are dangerous. Sebastian was attacked and almost killed by a large dog several months ago so we can hardly blame him. After an eventful day, we retreat to IT for some peace and quiet. It is the beginning of another crazy day. 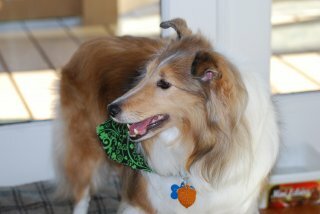 Jeff was up early this morning at 5:30 to take Sebastian for a walk before the big husky was out. Just as he was getting onto the dock, he saw the husky and its owner heading for shore. The dog was still not on a leash and was running ahead. Jeff decided to wait awhile until the coast was clear before taking Sebastian out. At 7:00 AM the dog owner left for work and the husky was no where to be seen, so poor Sebastian was finally able to walk the docks safely. Later this morning, Jeff went to talk with the marina manager about the incident last night. Boy did things turn out strange. It turns out the manager found the dog dead this morning about a mile away. It had been hit by a car. We later learned that the dog had run away early this morning and the owner had left a note at the marina saying that he could not find the dog and had to go to work. The dog apparently was trying to follow its owner and was hit by a car. It was sad to hear about the dog’s death in this way. The owner clearly was not being a very responsible pet owner. We are eager to get out of this marina. What a strange stay this has been. It is going to be another sweltering 90 degree day. We had hoped to spend the next couple of days exploring the many anchorages here on Watts Bar. With the heat and threat of thunderstorms for the next two days, we decide to save this exploration for another time and cut our trip short. After the morning fog lifts, we ease away from the docks to begin our 50 mile journey back home. Leaving is not without some more excitement. Keeping our green channel marker on our starboard, we next round the red channel marker on our port. Our depth alarm starts screaming and we are soon in 4’ of water and feel the keel squishing along the mud bottom. We are about to ground. Looking at the red marker again, we see a small green band on the top. This should have been our green marker. The red is denoting a shoal at the entrance to the marina. We quickly realize what happened and skim the bottom back into the channel. Boy was that confusing. It is another first for us. Thankfully the bottom is all mud and not rock. Life is never dull aboard IT. Back on the water things calm down and we have an uneventful trip, soon arriving at Watts Bar Dam. After a short wait, we again find ourselves in the bowels of the lock. It safely lowers us back into our home waters of Chickamauga Lake. The next few miles are very familiar as we have cruised this area many times. Arriving at our house, we decide to try the med mooring again. After two attempts, we are safe and secure, just one foot off our dock. This sure makes unloading much easier than at anchor. This is the end to another good trip aboard IT. 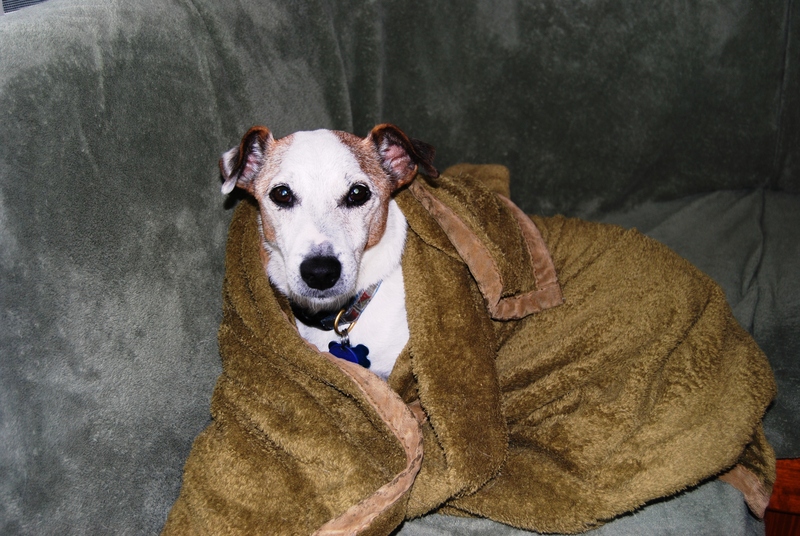 This entry was posted on September 6, 2013 at 10:11 pm. You can follow any responses to this entry through the RSS 2.0 feed. You can leave a response, or trackback from your own site. 1 Response to "Cruising the Tennessee River"
Just wanted to say how much I enjoy your blog. I am living vicariously through your adventures. Thanks for sharing!